HotelBrain CEO Ioannis Liakopoulos and Mr & Mrs White Paros New Style Hotel Nafsika Kouzeli. Greek hotel management and consulting company HotelBrain and 12 hotels under its management recently received a number of distinctions at the Greek Hospitality Awards 2018, in recognition of their excellence in the hospitality and tourism sector. HotelBrain’s Panos Paleologos received the Greek Hospitality Personality honorary distinction. HotelBrain was honored with the gold award in the Best Greek Hotel Management Strategy category, while founder and chairman Panos Paleologos received an honorary distinction as a “Greek Hospitality Personality”. Gold award to Mr & Mrs White Paros New Style Hotel in the Best New Greek Boutique Resort category. Gold award to Avaton Luxury Villas Resort – Relais & Châteaux in the Best Greek Villas & Holiday Homes category. Gold award to Mykonos No 5 in the Best Greek Hotel Tailor Made Guest Experience category. Gold award to Zinas Villas in the Best Greek Boutique Resort category and silver award in the Best Greek Villas & Holiday Homes category. Gold award to Aenaos in the Best Greek Heritage City Hotel category. Silver award to Oasis Beach & Spa in the Best Greek Beach Resort category. Silver award to Lotos Mountain Resort in the Best Greek Mountain Resort category. Silver award to Pirrion sweet hospitality in the Best Greek Hotel Breakfast category. Silver award to Polis of Naxos in the Best Greek Boutique City Hotel category. Silver award to Erodios in the Best Greek Pet Friendly Hotel category. Bronze award to Halcyon Villas in the Best Greek Villas & Holiday Homes category. Bronze award to Yasemi of Chios in the Best Greek Excellence In Service Hotel category. Organized for the fourth year by Ethos Events and Hrima magazine, the prestigious awards gala dinner took place at the Divani Apollon Palace & Thalasso on the Athenian Riviera. 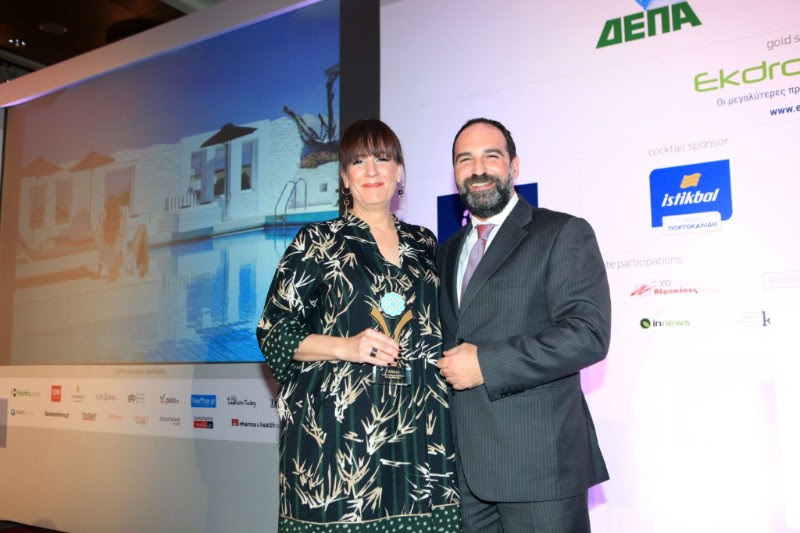 The award winners were selected among 149 nominees, which represented top Greek hospitality enterprises, by a judging committee and the readers of Hrima Magazine.